The thymus is a primary lymphoid organ constituted by a 3D epithelial network that provides a specialized microenvironment in which seeding lymphoid progenitors undergo phenotypical and functional maturation. 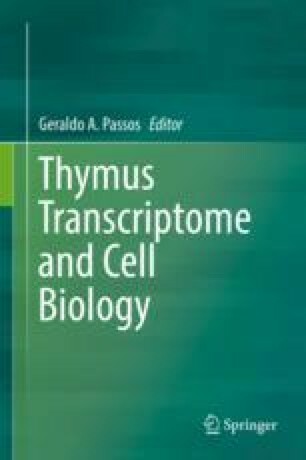 During the earlier steps of thymic organogenesis, the specification of the pharyngeal endoderm to thymus fate takes place independently of the expression of the transcription factor Foxn1 that, however, governs the later organogenesis of thymus together with the colonizing lymphoid cells. In the present chapter, we will review evidence describing early development of thymus and its resemblance with the development of endoderm-derived epithelial organs based on tubulogenesis and branching morphogenesis as well as the molecules known to be involved in these processes.